Remember when carnival cat racks were hand-painted and each one had its own unique personality? 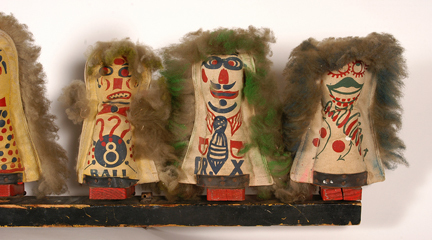 This tier of hand-painted canvas knockdown dolls from a vintage cat rack, also known as a doll or punk rack, will be on the auction block this weekend at Slotin Folk Art. The rack measures 74″ long x 5″ deep x 14″ high and is hinged. The pre-sale estimate is $1,000-2,000. It’s rare to find a whole row of ’em, since the majority of vintage games that have survived are broken up and sold piecemeal to collectors. In 2009, ATZ wrote about an auction of a complete cat rack as well as a duck pond, stick joints and all, which belonged to an old-timer whose father had been in the business forever. The seller tried to preserve these pieces of Vermont fair history and offered the games in their entirety for many months on eBay, but no buyers came forward. The dolls were (and some of them still are) being sold separately for $150-$175 and the antique stick joint is now available for a mere $249! The rack of nine carnival cats in Saturday’s Slotin Folk Art Auction is from the collection of George and Sue Viener, who own the Outsider Folk Art Gallery in Reading, Pennyslvania. The couple were introduced to the world of Outsider Folk Art and Americana in 1970 during a visit to the Abby Aldrich Rockefeller Museum in Williamsburg, Virginia. 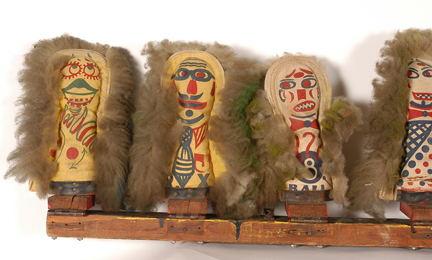 Viener told ATZ that he acquired the carnival doll rack a couple of years ago from a dealer in Pennsylvania. 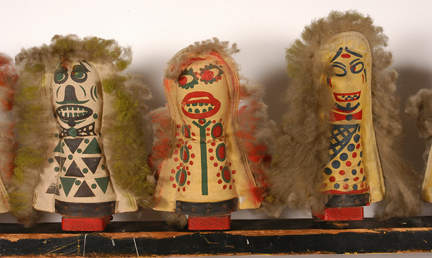 The dolls are decorated on both sides and each one is unique, unlike the standardized cat rack manufactured today. The row of dolls tips slightly forward, says Viener, which he theorized made it more difficult for players to knock them down and win the game. The cat rack has already attracted online bidders and will be sold at Slotin Folk Art’s “Who’s Who in Folk Art Auction” on November 12. A larger, 21-inch tall carnival cat from the Viener Collection is also up for bid. The two-day folk art auction consists of over 1,000 lots, with the first day devoted to the Viener Collection. The live auction will be held at Historic Buford Hall in Buford, Georgia. Absentee, phone and online bidding are also available on auction days. Wonderful, strange little beings. Are they alive? Thanks for posting them Tricia! Yes, Karl Wirsum! Back in 1997, Intuit, the Center for Outsider Art in Chicago, had a benefit auction of knockdown dolls made by Chicago artists including Wirsum, Nutt and others who had been influenced by carnival sideshow banners sold off from Riverview Park. I remember it very well because it was also the year I began writing about sideshow banners and their entry into the art world. I probably even have an old slide if I could find it!